"Vietnam Budget Tours" offers you memorable travel experiences: walking and food street tour in Hanoi Old Quarter, incredible cruise in Halong Bay, cycling to Tra Que village, cooking class and food massage in Tra Que village which is 5 km away from Hoian Old Town, discovery to Cuchi tunnels, famous during Vietnam War, amazing cruise and discovery in My Tho and Ben Tre provinces, gateways to Mekong Delta. "Vietnam Budget Tours" balances high quality of services and value for your money. 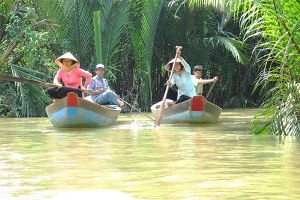 "Vietnam Budget Tours" emphasizes the daily life with local people. Experience, Explore, Live like Vietnamese people. Welcome to Hanoi, Vietnam ! Meet upon arrival at Hanoi International Airport, then transfer to the hotel for check-in. Time at leisure. Accommodation in Hanoi. Check in time at 02:00 PM. Discover Hanoi - the charming capital of Vietnam like locals. Early morning, a leisure walk heads to Hoan Kiem lake where older people practise Tai Chi exercise, play badminton or go walking. Afterwards, back to the hotel for breakfast. Enjoy a walking tour to experience Hanoi street food. Dive into the sights, sounds and smells of Hanoi. We explore the real Hanoi Old Quarter on foody tour which gives you the chance to taste local specialty in Hanoi: Bun Cha, Pho, Banh Cuon etc… You experience fine foods by local stalls like local inhabitants. Stroll across narrow streets to observe daily lifestyles and the secrets of inhabitants living in Hanoi Old Quarter. You can catch every moments and scenes of the bustling capital of Hanoi. Finally, enjoy an egg coffee at Giang coffee, a scrumptious local delicacy that we will sample whilst admiring the hustle and bustle of the city centre. Attend a performance of water puppet show. Overnight in Hanoi. 08:00AM depart for Halong bay, 180 km east of Hanoi, listed as World Heritage Area for its Outstanding beauty by UNESCO in 1994. 12:30 we board a traditional junk to discover the 8th World Wonder where the movie "Indochine" was realized with Catherine Deneuve, French star in the 1990's. Lunch on boat with fresh seafood. It is time to relax on the sun deck throughout the most beautiful landscapes with more than 2,000 islands and limestone islets, rising from the emerald water. Visit a natural cave, the most picturesque grotto in the bay. Swimming if possible and relaxing on the deck. Dinner & Overnight aboard. Early morning wake up in the quite atmosphere and pure air of Halong Bay. You can catch the sunrise from the sun deck. Taichi exercise on sun deck in the legendary fame by rocks formation in Halong Bay. Slight breakfast whilst continuing our excursion in the heaven of limestone islets. 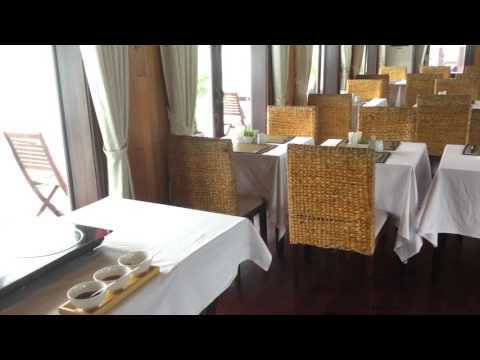 10:00 Enjoy a brunch while the boat approaches Tuan Chau harbor. 10:50 Disembark at Tuan Chau wharf. 11:00 Drive straight to Hanoi Airport. Visit a workshop of potteries en route and a typical village of the Red River delta. Meet our guide at Danang Airport and proceed to Hoian. Check in at hotel. Leisure time. Accommodation in Hoian. Today we discover Hoian Old Town listed by Unesco as World Heritage Site since 1999. Hoian was known to early Western merchants, the city was one of the major trading centers of South East Asia in the 16th century. Hoian has a distinctive Chinese atmosphere with low, tiled - roof houses and narrow streets. Many of the houses were constructed of rare timbers and decorated with lacquer panels engraved with Chinese characters and pillars carved with ornamental designs. Visit historic merchants and community houses, places of worship and Japanese covered bridge, Hoian bustling market. Afternoon: Depart to My Son sanctuary, 70 km from Hoian Old Town, the former royal city of Cham Empire during 4 - 16th centuries. My Son was listed as UNESCO’s World Heritage in 1999. Back to your hotel for refreshment. Overnight in Hoian. We ride a bike to visit a local market in Hoian which is non touristy at all. You can see local people buy and sell their products. They find foods of all kinds for their whole families every day. Then, continue cycling on the small path along paddy fields, fish ponds and bamboo trees. You have chance to hop on water buffalo whilst taking photos. Afterwards, you ride toward Tra Que village which is popular for its spicy and aromatic herbs. Upon arrival, you will be greeted by family host: welcome drink and cold towel for refreshment. 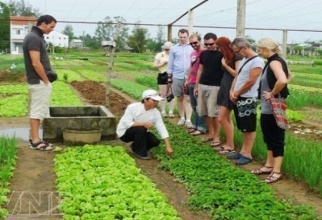 They will show you how to grow vegetables and spicy herbs: we walk through the herb gardens where local farmers work their fields using the traditional methods of hundreds of years ago - no electrical machinery here. You also can work leisurely as local farmers if you like. Moreover, enjoy a cooking class with host family to cook Hoian specialty: My Quang noodle, white roses…Our family chef will explain you all about the herbs in cuisine and medicine. We pick fresh herbs in the garden for our cooking lesson later. Working together with our family Chef we learn the traditional ways of preparing and cooking Vietnamese food from scratch. Using the freshest organic ingredients direct from our garden and traditional Vietnamese utensils (still in use today) we cook 4 famous dishes. You taste what you have cooked as regional cuisine. A herbal food massage will help you relax after meal. Finally, you bike around Hoian rural area on the way back to the hotel. Refresh and relax. Overnight in Hoian. AM: Leisure time for your own discovery or shopping in Hoian Old Town. 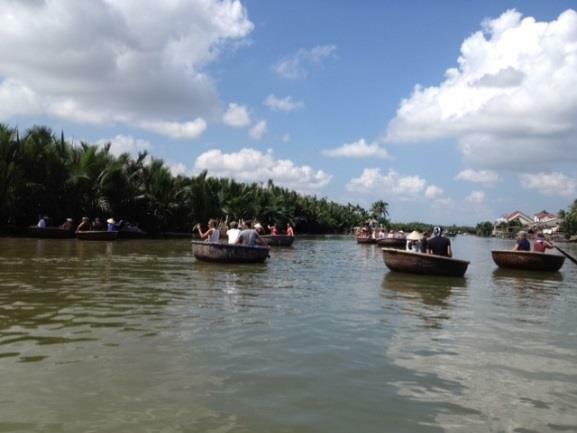 Optional Tour: A basket boat cruise in Cam Thanh commune in the water coconuts trees. We will depart from Hoi An Coco River Resort. Take a boat cruise around 15 minutes during which we will explore the Thu Bon river. Then, enjoy a typical local basket boat to reach Bay Mau Coconut palm forest - a revolutionary base for the resistance during the war - which is nowadays a luxuriant biosphere reserve in Hoi An. You can enjoy the verdant nature all around at this path alongside the quiet river while learning how to make the animals, the jewelries with the coconut palm leaves or practicing to become a fisherman. Then we continue our trip by bicycle to reach Dap Muoi where local people produce the basic salt and to explore Cam Thanh countryside. We will ride along the little riverside borders and cross a variety of interest sceneries such as rice fields, fish farms and lots of others. During the tour, you will have chance to meet and talk with local people who will give you very interesting and funny experiences. You can also take unique pictures of this wonderful landscape. If you already visited this before, you will be impressed by the changes which are operated every day by locals to improve their homelands but still remain the traditions. It is a really pleasant time for relaxing and enjoying the fresh air of the countryside. This excursion is the perfect way for spending a nice day, closer to the nature and the inhabitants. PM: Fly to Hochiminh city/ Saigon. Meet our guide at Saigon Airport, transfer to the hotel for check in. Time at leisure. Overnight in Saigon. Drive to Cu Chi tunnels. At its height, the tunnel system stretched from Saigon to Cambodian border and was three levels deep. There are more than 200km of underground tunnels, consisting of a main axis system with many branches connecting to underground hideouts, shelters and other tunnels. The remaining tunnels have become a major tourist attraction giving the visitor a unique experience and a feel of what underground life in the war must have been like. Return to Saigon. Lunch at local restaurant in Saigon. Discover Hochiminh city (formerly Saigon), the biggest economic center in the country: visit Opera house, cathedral Notre Dame, Post Office, War Remnants museum, a lacquer factory. Overnight in Saigon. Today, we leave behind the bustling city of Saigon to explore Mekong Delta, famed as the first rice bowl of Vietnam for exporting rice oversea. Upon arrival in My Tho city, enjoy a boat cruise on Tien river to Ben Tre land. On the way, visit fish farms, fishing market. Stopover at Ba Chi orchard to taste tropical fruits and listen to traditional folk music in the garden. A leisure walk along shady and palm fringed trails passing by local villages where you can see their peaceful daily life. Continue our cruise to Tan Thach to visit a small coconut workshop, just to get a glimpse of typical family run business in this area to see how to make coconut candy and sample some candies. Then, a horse carriage will take you to local market at Tan Thach village. Afterwards, you head out to An Khanh village by boat. Walking under coconut shadow on the path leading to the local restaurant located in the tropical garden. Relax with a rowing boat on narrow water palm creek to indulge into local lifestyle before returning to My Tho by motorized boat. Please contact our Tour Managers at info@vietnamviaggiarte.com to book "Vietnam Budget Tours" today. Note: "Vietnam Budget Tours" set daily departure. Please contact our Tour Managers for any assistance. 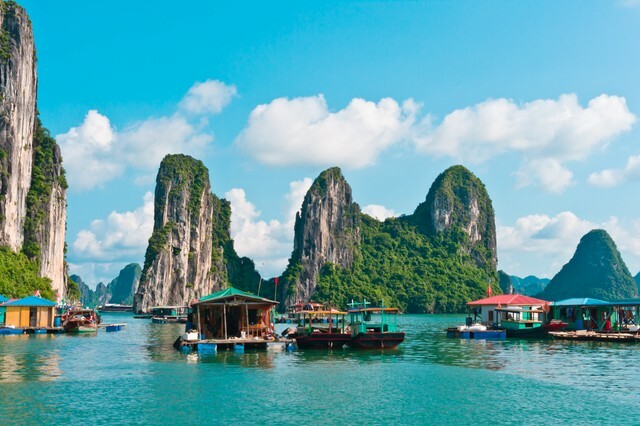 Words from experts: "Vietnam Budget Tours" features highlights of Vietnam with stunning landscapes and real travel experiences. 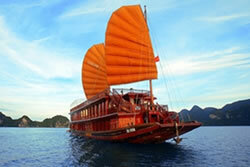 With "Vietnam Budget Tours", we focus on sightseeing, amazing activities and leisure time for you. So you can explore "Vietnam Budget Tours" with your family or relatives. This program "Vietnam Budget Tours" is designed to deliver the high quality of services at best prices. Please note that "Vietnam Budget Tours" is not to give you the worse services, we guarantee to serve you the best services and memorable travel experiences of a lifetime. We keep in mind that your time holiday is valuable and precious. 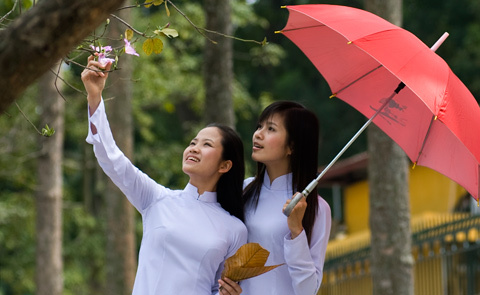 We strive to save time for you and value every moment of your holiday in Vietnam.